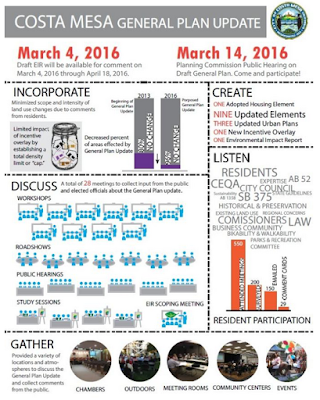 The Costa Mesa Planning Commission, led by Chairman Rob Dickson, meets again on Monday, March 28, 2016 beginning at 6:00 in City Council Chambers at City Hall and has a full agenda, including three developments which add 49 dwelling units to the city inventory. You can read most of it HERE. I said "most" because the first Public Hearing, the 2015-2035 General Plan and Draft Environmental Impact Report had no staff report available at press time. I suppose it will become available sometime Thursday. 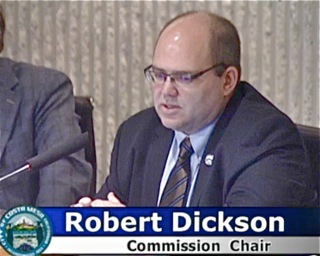 Anyhow, the staff recommendations are to 1) Receive presentation of General Plan and Draft EIR and public comments and, 2) Continue to the Planning Commission meeting of April 11, 2016. 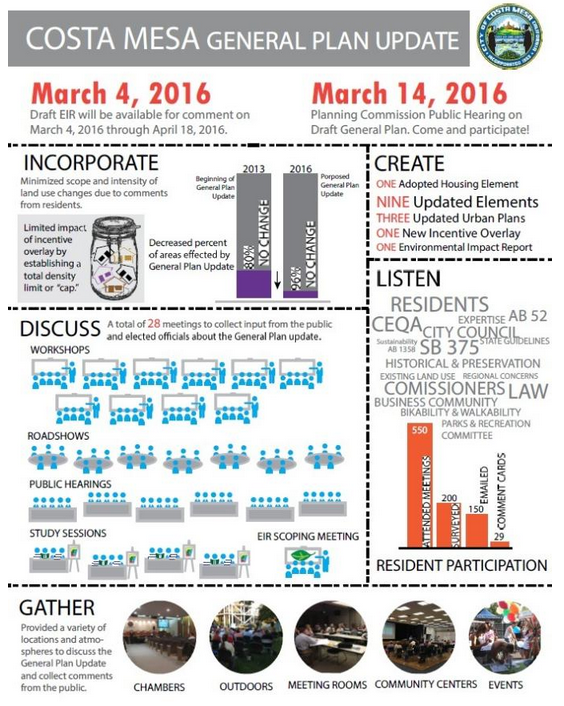 Written comments on the Draft EIR must be submitted by 5:00 p.m., April 18, 2016. Public Hearing #2, HERE, is for a 6-unit, two-story Small Lot Development at 592 Hamilton Street. Minor deviations are being requested. I have no doubt the commission will move this one forward. Public Hearing #3, HERE, is a 10-unit detached Small Lot Development at 522 and 526 Bernard Street within the Mesa West Residential Ownership Urban Plan. This one has several deviations, so it will be interesting to see if the commission just rolls over on this one and allows all, or any, of them. Public Hearing #4, HERE, is for a 33-unit, two-story detached residential common interest development at 2626 Harbor Blvd. It requests only one deviation, a reduction in the space between main buildings from 10 feet to 6 feet. I will say if there is going to be development all around town, at least these projects fir in with what makes more sense than the straight up row houses. They may be packed in, but much better. Now whoever buys one of the units that is asking for 6 feet separation rather than 10, may be unhappy down the road. . The fire code and building code would never have allowed this in history. It is the fire sprinklers that supposedly makes the difference. Only problem there is that the outside can still burn with no problem, and the fire person will have more difficulty squeezing through with 6 feet. I would not approve 6 feet no matter what if I was sitting on the planning commission. The first big fire will wake up the greed machine. Wow! Let's just hope none of these couples have children that require outdoor space. Some of the variances requested are seriously reducing the setbacks. Some by as much as 40%. Add the 4 foot reduction by 22 homes and it's 88 feet. These Developers are getting too greedy and creating complexes that are just too dense. They look like blight even before they get moved into. What happens when businesses such as Cadillac, want to set up shop in Costa Mesa (yeah right, but it could happen)? Where would they go if everything is residential? Wouldn't some commerce in the mix be nice? If Harbor goes the way it is planned now, it will be all residential high density on both sides all the way down to 19th. Will we all have to drive to Huntington Beach to do any sort of business?